Nonimmigrant visas are for individuals who wish to come to the U.S. for a temporary stay, for vacation, to attend school, or for temporary employment. They are issued for a temporary period of time ranging from one day to several years. In most cases, an individual must establish that he or she has a residence in his home country that will not be abandoned. If you have questions or concerns about non-immigrant visas, please contact one of our experienced New Jersey immigration attorneys today for a free consultation. "A" visas are granted to foreign government officials, their families and servants. This includes ambassadors, public ministers, diplomats or consular officers who are assigned to represent their country in the U.S. 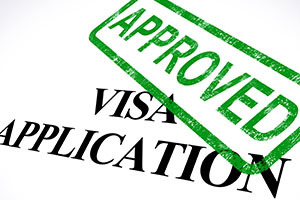 The processing of these visas is usually handled directly by the sponsoring organization. B-1 visas are granted to foreign business people coming to the U.S. for their foreign employer. They are also issued to self-employed individuals who need to conduct business, such as attending meetings or conferences, meeting customers, or negotiating contracts. B-2 visas are issued to people coming to the U.S. to visit friends or relatives, to vacation or to accompany a B-1 visa holder as described above. "C" visas are transit visas. People use them who are traveling through the U.S. to a final destination outside the U.S. Those admitted in "C" status may remain in the U.S. for a maximum of twenty-nine days. Some people who are in transit through the U.S. do not have visas. Transit without visa or TWOV is reserved for those who are applying for admission to the U.S. to travel on to another country. Someone flying into the U.S. who has a confirmed reservation, within a specified time period, to catch a connecting flight to another country will be admitted as TWOV. Aliens in TWOV status are not permitted to leave the airline terminal. Application for TWOV status can only be made at certain designated U.S. ports of entry. Aliens who are applying for admission into the U.S. as members of a foreign vessel’s crew such as flight attendants on foreign owned airlines or crewmen on foreign owned ships use this visa. E-1 visas are available to Treaty Traders, while E-2 visas are available to Treaty Investors. Both categories require that the United States maintain treaties of commerce and navigation with the foreign country, allowing for trade and/or investment in the United States. Treaty traders enter the United States for the sole purpose of carrying on substantial trade. Treaty investors enter the United States to make a substantial investment in a U.S. business, and to direct and develop the business. F-1 visas are available to aliens coming temporarily to the United States to attend school. The applicant must plan to pursue a full time program of academic study at an educational institution that is authorized by the USCIS to enroll foreign students. Similar to "A" visas, "G" visas are issued to representatives of international organizations like the United Nations and World Bank, as well as missions. This is a very broad visa category and covers several different types of temporary workers including: aliens in specialty occupations; farm workers and other temporary nonagricultural workers; trainees; and family members of "H" visa holders. "Aliens in specialty occupations" (professionals) who have a temporary job offer in the U.S. may be eligible for H-1B classification. This category is divided into two groups: H-2A. Temporary agricultural service workers and H-2B. Other workers who will be performing temporary services of labor in which U.S. workers are not available, including some seasonal jobs, certain child care situations, and individuals who will be training U.S. workers. The H-3 visa is available to individuals employed by a business in the US, who will participate in a formal training program that does not involve productive work (productive work can only be incidental to the training). This visa category is reserved for aliens who are coming to the U.S. temporarily to work on behalf of a foreign information media such as a foreign newspaper or television station. J-1 visas are available to aliens who will be participating in an Exchange Visitor Program including experts, foreign students, industrial and business trainees, "international visitors", medical interns and residents, and scholars. This category is available to aliens who are outside the U.S. and are engaged to be married to a U.S. citizen. L-1 visas are granted to aliens who have worked for a company abroad, as executives, managers, or in a specialized knowledge capacity and are being transferred to the US to work for a branch, subsidiary or affiliate company. M-1 status is similar to F-1 status. It is for students of vocational or other recognized non-academic educational programs. This does not include English language programs. NATO visas are granted to representatives of countries that are members of the North Atlantic Treaty Organization (NATO). "O" aliens are those who have extraordinary ability in the sciences, arts, education, business or athletics. This includes those in the motion picture or television industries. "P" visas are reserved for athletes, artists and certain entertainers who have achieved national or international recognition as outstanding in their field. P-3. Artists or entertainers coming to perform in programs that are culturally unique. This category was created to allow employer’s like Disney to bring foreigners to the U.S. for temporary periods to work in places such as Epcot in Florida. This category was created for religious workers coming to the U.S. to perform temporary services. This classification was created for aliens who assist law enforcement agencies in supplying critical information about criminal enterprises and terrorism. The “T” classification is designed to assist individuals who are in the U.S., American Samoa or the Commonwealth of the Northern Mariana Islands as a result of being victims of severe forms of trafficking in humans, commonly known as slavery. This category is for business people from either Mexico or Canada, coming to the US for temporary work pursuant to the North American Free Trade Agreement. "U" Nonimmigrant Status is set aside for victims of crimes who have suffered mental or physical abuse because of the crime and who not only have information regarding the activity, but also are willing to assist government officials in the investigation of the criminal activity. The V visa is for spouses and children of lawful permanent residents, who have been waiting for many years for a visa to become available to them because of the backlogs in quota availability.